I’ve been on restriction and not allowed to hike since last October. But now I’m allowed short walks on mostly level ground, so I’ve been trying to find walks that are easy and flat but still give me a good dose of nature. 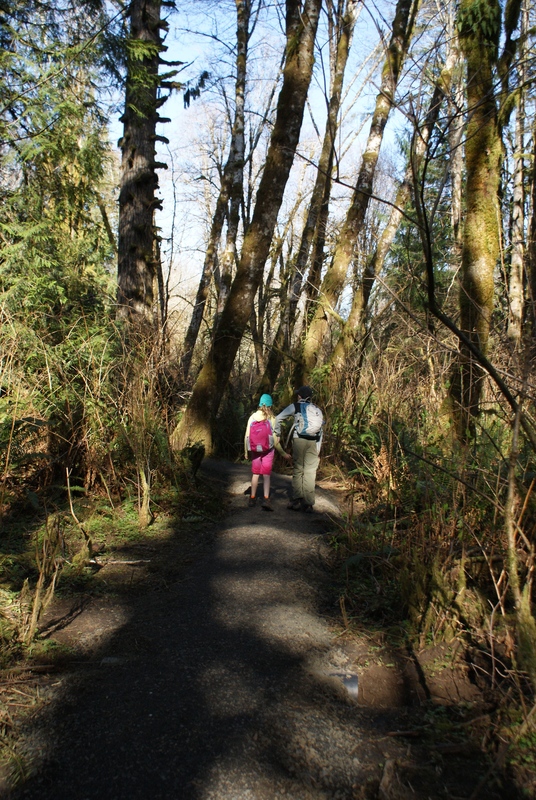 I was perusing through the Winter Hikes of Western Washington card deck by Craig Romano, and found this sweet little nature walk down by Olympia. It was new to me, so we drove down this afternoon and checked it out. 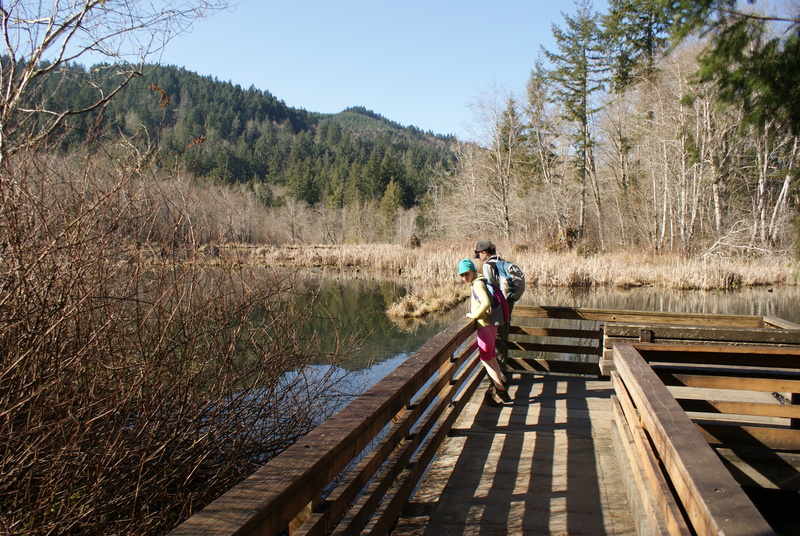 The McLane Creek trail is part of the Capitol Forest, and makes a loop around a wetland and small lake. Much of the trail is raised boardwalk, and the paths that are on the ground are graveled and are smooth to walk on. You can see the evidence of beaver activity all around the lake, and waterfowl and other birds make their homes here. We were delighted to observe ring-necked ducks (the males have a gorgeous white outline on their beaks), mallards, and gadwalls, as well as a song sparrow, Pacific wrens, and Stellar’s jays. Annika was enthralled by the numerous rough-skinned newts we could see in the water. She said they were adorable! Gabe thought they looked like alien fish. 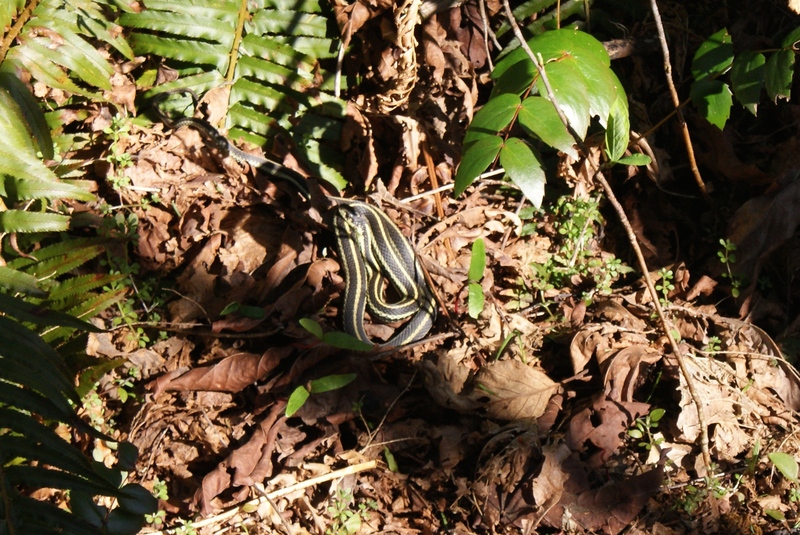 We even had the luck to see a garter snake, black with yellow stripes. We saw frog eggs in the water, so later in the spring you’ll probably be able to find some little hoppers around. The path makes a 1-mile circuit around the lake and in the forest. There is a straight 0.3-mile Railroad Grade path that bisects the loop, so you have a few options for shorter or longer loops. If you take the shorter loop, the trail total is about 0.6 mile. There are also 3 spur trails that dead-end at McLane Creek, which have overlooks to view the creek (and presumably salmon during spawning season). We opted to do a figure-8, traveling the Railroad Grade twice so we could see all of the outer loop. I figure we did about 2 miles altogether, but it was all easy and didn’t feel too long, even in my out-of-shapeness. We could see ample evidence of beaver activity at different spots around the pond. Unfortunately we didn’t get a glimpse of the furry creatures themselves. 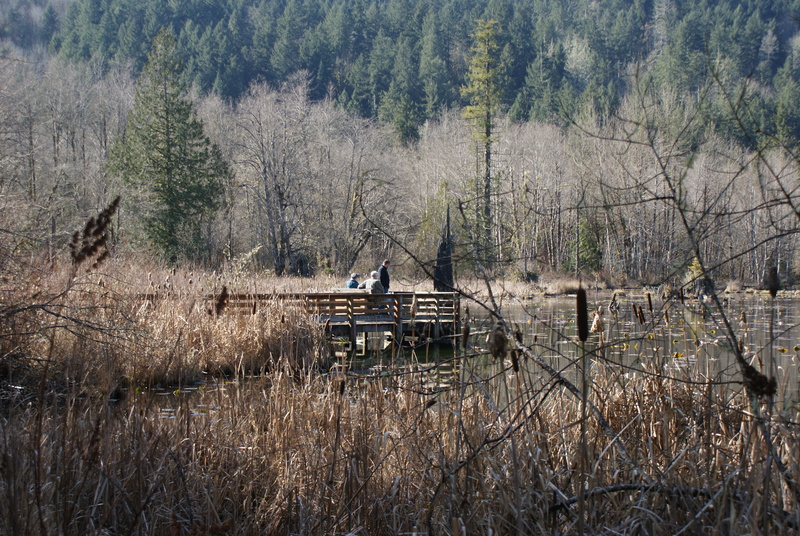 The wetlands seem like they are gearing up for spring – almost ready to bud out in force. 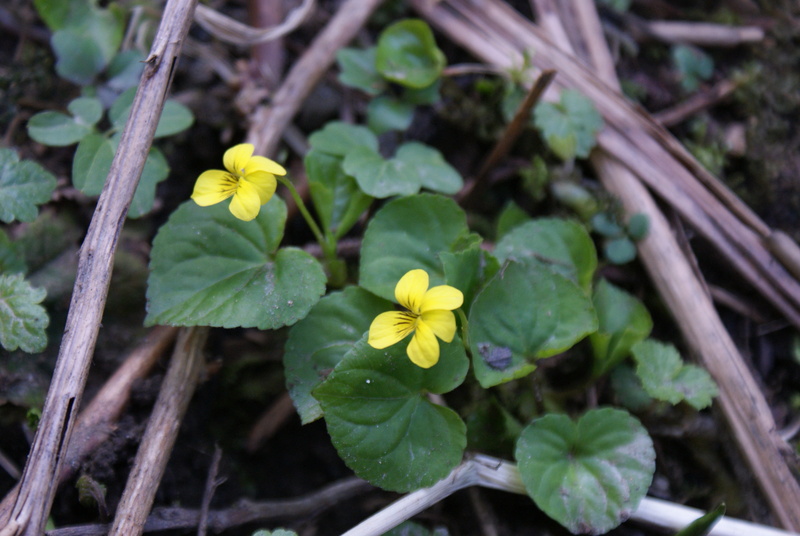 Indian-plum were finishing their blooms and leafing out, and some yellow violets were scattered in one area. 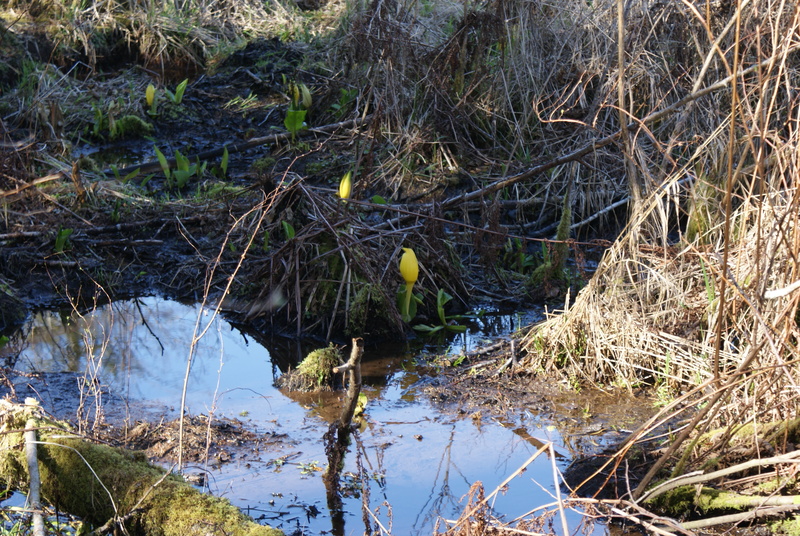 Skunk cabbage are just coming out now, with only the faintest whiff of skunky odor. I imagine a morning visit would allow visitors to hear and see more birds that we did. If you go: Read more about the trails and get driving directions on the WTA website. Find a map for your walk here. There are pit toilets at the trailhead, and two picnic tables. Benches and lookout platforms are sprinkled throughout the trail allowing for rests. You’ll need a State Discover Pass to park. Edited to add: There is currently a sign up saying that the trails are closed on weekdays while they do trail work. It does indeed look like work is in progress in some areas, so you’ll want to keep this one for the weekend this spring.